Shopping downtown Jeffersonville means finding customer service and merchandise that’s infused with local heritage and can’t be found anywhere else. Shopping in downtown Jeffersonville means helping locally-owned downtown businesses compete with the big box chains in the suburbs. The perfect space for rehearsal dinners, anniversaries, wedding receptions, banquets, and meetings. Flower shop featuring fresh and silk arrangements, planters, and balloons for any occasion. Bellawillow is a small photography and design business. We offer many photography services and custom print packages. Our custom art and designs can be used for logos, business cards, brochures and more. Blessings on Spring is a boutique filled with new women's fashion clothing, jewelry, and accessories. They also have gifts, treasures, and unique items that are meant to be just that... BLESSINGS! If you are on the search for that perfect gift come explore all the many things this shop has to offer. Blessings on Spring is full of a wide variety of items to satisfy your shopping needs. Its welcoming feel will leave YOU feeling blessed! So come in and check us out. We can't wait to see you! The Brilliant Bumble Bee Toy Store is a toy store with a mission. We believe that it is our responsibility, privilege and joy to positively impact the lives of children by providing quality toys that foster creative play, as well as educational opportunities that most toy stores don’t offer. We have toys for children from birth to 14. Most of our toy lines are made from sustainable materials such as bamboo or wood from rubber trees. We have Lego, Hape, LeToyVan, Begin Again, Plan toys, and many others. We also offer educational opportunities such as sign language class, story time, Lego robot class, introduction to computer programming, art, and movement. Body-Mind restoration programs for people who are ready for a healthy change. Fragrances that are neither fakes or copies and are discounted below major retail stores. Silver jewelry and purses. Going on 20 years at the same location. E.M. Coots' Sons Funeral Home is most likely the oldest family-run business in Clark County. The business was founded in 1860 by the first Edwin M. Coots and spanned five generations of the Coots family. This great downtown Jeffersonville business has been in its current Maple Street location since 1927. Steven M. Johnson, D.O. Rafael Cruz, M.D. Edna B. Pretila, M.D. Glo Spa & Boutique offers relaxing and therapeutic facials, chemical peels, microdermabrasion, microcurrent and LED light therapy, plus much more! For all your hardware needs. Fasteners, paint, plumbing, electrical, tools, adhesives, grass seed, etc. We also cut keys, repair windows, screens, cut and thread pipe, and a lot more. Comic books, games, trading cards. This wonderful library has books, movies, downloads, and a superb children's area. 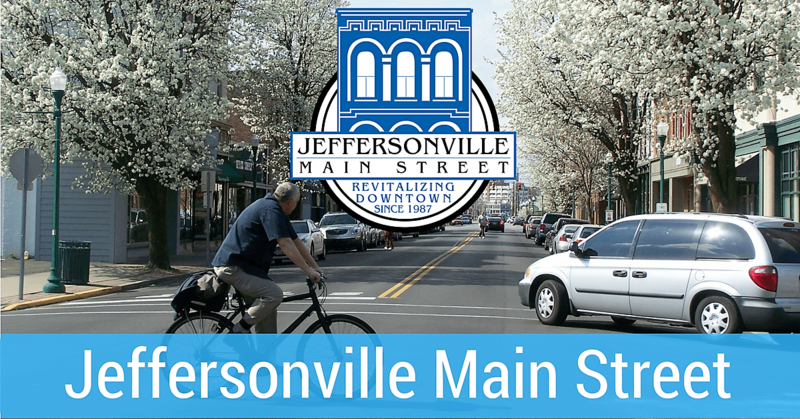 It is located in the heart of downtown Jeffersonville. KYE's is THE place for your event. Attorney’s At Law, criminal law, personal injury and municipal law. Licensed in Indiana and Kentucky. Beautiful floral arrangements for any occasion. Manufacturing confectionery and candies since 1891. Enjoy the soda fountain and lunch. Tour the museum and demonstration area. Silica Ceramic Studio brings friends and families together for a unique creative experience. The studio offers a range of kiln related classes, workshops, demonstrations and "make and takes" to engage adults and children alike. The welcoming studio décor makes Silica Ceramic Studio the perfect space to host a party or corporate team-building event. Because they value education in all forms, all teachers and school staff will receive a discount at Silica Ceramic Studio after presenting a current school ID. Affordable advertising and marketing that produces real results for small businesses. Spa Natur's goal is to bring quality massage and spa services to the hard working people of this area at incredible prices. The therapy they offer is beneficial to improving stress, sore achy muscles, circulation and much more. With this holistic approach, you will be sure to see the results for yourself. Upscale antique mall, with antiques, collectibles, and unique gifts. Sweet Annie's Vintage Finds features unique antique housewares, dishes, and home décor. The business is located in a restored home that evokes charm and appreciation of historic preservation. The Clipper Barber and Styling Shop has been serving the community for over 30 years. Our traditional barbershop offers services for kids, adults and seniors with all hair styles. Supplies for all you home and office needs. Full line of printing available. Locally owned and operated since 1970. Southern Indiana’s Most Complete. The Shop at LL&A carries a variety of unique home accent items, jewelry, gift ideas and more. Carrying the latest trends in interior design, they have everything from furniture to wall art, conversation pieces, and hard-to-find gems. Located just steps from the foot of the Big Four Bridge in historic downtown Jeffersonville. A full service spa for the mind, body, and spirit. From trophies to plaques VIP has every award imaginable. They are also about more than awards -- they have great gift items that have local customizations. They offer Laser Engraving, Rotary Engraving, and Full-Color Sublimation.